Orienteering is a fun and challenging outdoor adventure sport that exercises both the mind and body. The aim is to navigate between a series of checkpoints (aka "controls") marked on a special, highly detailed orienteering map while deciding the best route to complete the course in the quickest time. Orienteering can either be a competitive individual sport or a totally recreational activity. It is suitable for all ages, fitness and experience levels. If you enjoy hill walking, fell running, cross-country running or geocaching there is a good chance you will also enjoy orienteering. Do I need to be a member to start? No, just come along to any of our events and give orienteering a go. If you find you enjoy it then you are very welcome to join the club. Anyone!, We have members of all ages from toddlers to Senior Citizens; many are family memberships. What is an orienteering "event"? Where do events take place? We use the parks and woodlands around Swansea and have many parts of the Gower and Brecon Beacons specially mapped for orienteering. One week, we could be racing on sand dunes, and the next, we could be up on a mountain!. See a map of the areas we orienteer on. In the Summer we usually hold a series of events which we call the summer league. These are held weekly, mostly on Wednesday evenings and usually start around May and finish in late August. During the winter we hold another 2 series of events, the "winter league" and the "night league". Take a look at our events page for all the details. At each of these, there are a range of courses, including ones ideal for new orienteers. You will find plenty of enthusiastic help from existing club members at these, so again, feel free to just turn up. An orienteering map is a map specially prepared for use in orienteering competitions. It is a topographic map with extra details to help the competitor navigate through the competition area. Orienteering maps are much more detailed than general-purpose topographic maps, and incorporate a standard symbology that is designed to be useful to anyone, regardless of native language. In addition to indicating the topography of the terrain with contour lines, orienteering maps also show forest density, water features, clearings, paths and roads, earth banks and stone walls, ditches, wells and pits, fences and power lines, buildings, boulders, and other features of the terrain. Perhaps the biggest difference between orienteering maps and maps that most people are used to is the scale – most of our events use 1:10,000 scale maps. This means 1cm on the map is equal to 100m on the ground. 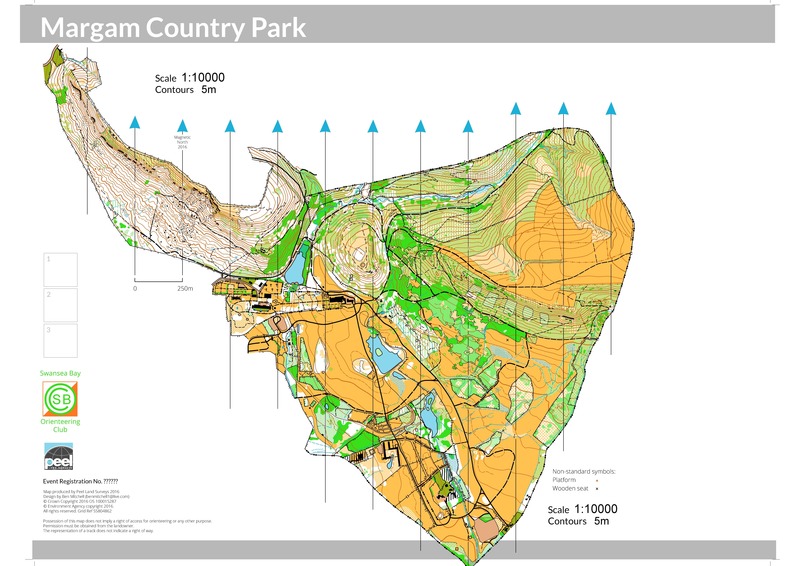 Some maps, particularly sprint orienteering maps use a larger scale, normally 1 :4000. The following legends are very useful to help you understand symbols on orienteering maps. ISOM 2017 map symbols are those used for normal orienteering maps, generally at 1:10,000 or 1:15,000. ISSOM 2007 sprint map symbols are those used for sprint orienteering maps at 1:5,000 or 1:4,000. Below is one of the clubs orienteering maps. See if you can figure out what some of the features are. No special equipment is needed to start with, just comfortable outdoor clothing and footwear. Compasses are not necessary for beginners and most people soon master the map reading skills. Once you progress from a beginner level the normal rules are that the legs and torso must be fully covered while orienteering (short-sleeved tops are allowed but not vests). This applies even in warm weather because courses can include sections through the undergrowth. At some events (e.g. if there is no undergrowth) the rules are relaxed and shorts and vests can be worn. Just ask the event organiser if you're not sure. Only if you want to. There are a range of courses on offer including ones suitable for walking or jogging. After all your biggest competition in orienteering is with yourself. Yes! Walking is best when you start so that you don't get lost, but getting fitter is a distinct possibility. Some of the top elite orienteers are some of the toughest and fastest runners in the world. If you decide to come to one of our events for your first taste of orienteering, all of our volunteers are able to offer advice. Speak to a member of the registration team and explain your situation and they will be able to suggest a course for you to have a go at. Some of our events are aimed specifically at those new to the sports. This is usually the shortest course on offer and is aimed at young children who are moving off the string course (see below) and into the terrain. The courses are very simple and stick to main paths. These courses are slightly more technical than the white courses with controls slightly off the paths, but on easy to find line features such as streams or walls. The orange courses are the usual start point for adult beginners at orienteering. Here you will be presented with basic route choice options and will use simple compass skills. Here the technical and physical difficulty is increased again. The courses are slightly longer than orange and utilise point (e.g. boulders) and contour features. Mostly used by under 16's and adult improvers. As difficult as the area will allow. (Ideally TD5), using contour features, ‘point’ features, etc. Used mostly by experienced under 18s and adults wanting a relatively short run with a technical challenge. As for Green (the highest technical difficulty) but longer and more physically demanding than green courses. 3. Find registration and enter your desired course. There is a small fee (£3 - £5) for registering onto a course (this covers the costs of printing + insurance). You will be given a timing chip, known as an Si-card, as well as a list of control descriptions and a start time (everyone starts at different times, so you can't just follow each other!). The control descriptions give details of the control sites that you should visit (in the correct order). Each control site will be a feature on the map (path junction, bend in a wall, stream, hill top, gully, etc). At each control site, there will be an orange / white marker flag, with a small box attached that will register that you have been to that control. There will be typically 8 - 20 control sites to visit, depending on the length of the course. Running / walking shoes are needed and clothing that covers your legs and arms (normally needed for protection from brambles etc). Those doing harder courses will normally use studded trail running shoes. Take a waterproof coat if the weather is bad. A compass is needed for the harder courses, and it is good practice to start using one as soon as you can - the club can lend some to newcomers. As you start, you will you will be given a map with your course over-printed in purple. You aren't given the map before you start as the ability to decide on route choices as you go, rather than in advance is a key part of the sport. Now comes the fun part - actually doing it. You will need to navigate from the start to the first control site, and then around the rest of the course. For the easier courses, this will involve deciding which path to take, or which fence to follow, and so if you can relate the map to what's on the ground, there should be no problem. For the harder courses, often the fastest route between controls is through the terrain. 7. Help, I'm lost! Don't panic. You will need to make your way to an obvious feature on the map (path, stream etc - especially where they meet or cross) and then you should be able to work out where you are (relocating). If all else fails, ask the next orienteer you see (we've all done it!). The finish is normally close to the start and your time is recorded as you finish. You will need to download your si-card to get your time as well as the split times between the controls. Most important of all you can see if you have completed the course correctly. It's important to make sure you download even if you do not finish the course as this lets the organisers know that you are back safely. You can keep your map and splits to look at later to see how you should have done it! It's a great idea to talk about your course after you finish with someone expirienced while its still fresh in your mind. Analysing your choice of routes is one of the best ways to develop your skills. Results are usually put online within hours of the event so you can see how your time compares with other competitors. Below are some fantastic videos that should help you get an idea of what our sport is all about! If you still need convincing to try out orienteering, please read this!